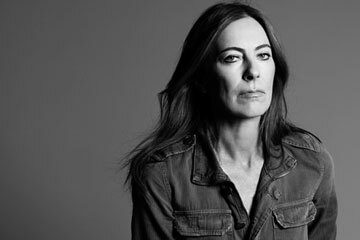 In the late 1970s, the young artist Kathryn Bigelow had a thought-provoking conversation with a friend of a friend by the name of Andy Warhol. "Andy was saying that film is way more populist than art  that art's very elitist, so you exclude a large audience," she recalls. Around the same time, she visited the Museum of Modern Art, paying special attention to Kazimir Malevich's Suprematist Composition: White on White and Piet Mondrian's color-block grids. "I remember thinking, The audience for this is very specific," Bigelow says over lunch in her hotel suite at the Ritz-Carlton Central Park, not far from the museum. "A Malevich or a Mondrian requires that you come to it with a certain amount of information, a context. And you don't necessarily need that with film. A movie is accessible, available. That was exciting to me from a political standpoint." She emphasizes the word political, lingering over it for a moment. Bigelow's film The Hurt Locker (2009), which logs 38 days with a bomb-disposal unit in Baghdad, was widely perceived as taking a neutral or apolitical stance on its subject matter  if such a stance is possible when the subject matter is the U.S. occupation of Iraq. It won nearly universal praise as well as the Academy Award for Best Picture. Bigelow's follow-up, her second collaboration with screenwriter and journalist Mark Boal, was originally planned as a feature about special forces hunting Osama bin Laden in Tora Bora in 2001. Boal was deep into his screenplay when news broke of the SEAL Team 6 operation that killed bin Laden in Abbottabad, Pakistan. Almost immediately, he and Bigelow switched gears, instead mounting a chronicle of the 10-year hunt for the al-Qaeda leader. The movie that resulted, Zero Dark Thirty, which was No. 1 at the U.S. box office in its first week of nationwide release and has been nominated for five Oscars, is in many ways as dispassionate a procedural as The Hurt Locker. Yet it has become the most politically divisive motion picture in memory. Not only does it stage brutal scenes of American operatives practicing torture at CIA black sites in the wake of Sept. 11, 2001, but in the eyes of many experts, it also forges false connections between information gleaned by torture and the eventual discovery of bin Laden's hideout. In December, Senate Intelligence Committee chair Dianne Feinstein and Armed Services Committee member John McCain and chairman Carl Levin wrote a letter to Sony chairman Michael Lynton calling Zero Dark Thirty "grossly inaccurate and misleading in its suggestion that torture helped extract information that led to the location of Usama bin Laden"  specifically, the nom de guerre of bin Laden's courier Abu Ahmed al-Kuwaiti. The Senators also asked the CIA to disclose what access and information Bigelow and Boal received from the agency. According to a statement by Michael Morell, acting director of the CIA, which cooperated with Bigelow and Boal in the making of Zero Dark Thirty, the film "creates the strong impression that the enhanced interrogation techniques that were part of our former detention and interrogation program were the key to finding" bin Laden, but "that impression is false." Journalists with deep knowledge of post-9/11 CIA culture, interrogation techniques and black sites, including the New Yorker's Jane Mayer and Pulitzer Prize winner Steve Coll, have lambasted the film, with Mayer accusing it of "providing false advertising for waterboarding." New York magazine critic David Edelstein labeled Zero Dark Thirty "borderline fascistic." He also called it the best movie of 2012, as did the New York Film Critics Circle. Some 35 years have passed since Bigelow's chat with Warhol. Back then, she was picking up work as an artist's assistant and had a small National Endowment for the Arts grant for a short film, The Set-Up, in which semioticians provide running commentary on a fistfight between two men. Now she directs major Hollywood productions with high-level CIA input; Zero Dark Thirty is poised to become the highest-grossing movie of her career, with $58.1 million in receipts to date.